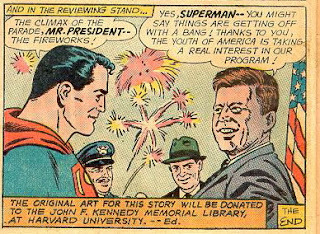 I wrote many years ago about the famed Action #309 issue, where Superman divulges his secret identity to President Kennedy so the later can impersonate him (as Clark Kent) at an event where both Supes and Clark are both expected to appear. Horrifically for DC, the issue appeared on the newsstands a full month after JFK was assassinated, although (obviously) it had been scripted, drawn and sent to the printers before the events in Dallas. Controversy arose when the original artwork was found up for auction 50 years later -- not in the library as originally planned. Plastino asked a New York state court to release the name of the person who sent the artwork to auction in an attempt to retrieve the piece and ensure its public display. "I do not want anyone to feel sorry for me. I just want the right thing done here and to be treated fairly," he wrote in a Facebook post to fans. The auction has been removed from the schedule, but the fate of the famous Kennedy comic remains up in the air. Plastino believed the artwork was supposed to have been donated to the planned Kennedy Library in Boston 50 years ago, the same year Kennedy was assassinated, according to court documents. Plastino was surprised to learn recently that it was scheduled for auction on Friday in Beverly Hills, California. Heritage Auctions has since pulled the artwork from this week's sale, said Heritage spokesman Noah Fleisher. Kudos to longtime commenter and emailer M Hamilton for finding this. Unforgettable Sights of a Paper World, a blog about comics from Antonio Gatti, an Italian comics blogger (don't worry, it's written in English). It's interesting to get a foreigner's perspective on the Man of Steel. Here's a review of the terrific story from Superman #137, featuring Superman's evil duplicate, Super-Menace. I reviewed the same issue many moons ago.